One of our favorite ways to teach is using political cartoons. The Civil War offers a great opportunity to do this as so much time is spent on military action that students can feel bogged down in statistics. 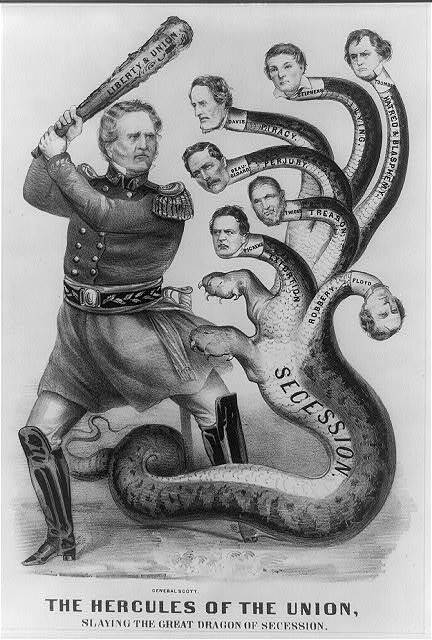 This cartoon depicts General Scott as Hercules slaying the great hydra. We have included questions and answers along with the cartoon for your classroom use. Narrated by Ronald Reagan, this film highlights the achievements of the Tuskegee Airmen in WWII. A gem of a film that shows the lengths advertising companies went to to market products in the 1950s. Over the top characters are depicted in the race to sell, sell, sell. A discussion on modern-day cliches would be an excellent follow-up lesson, with students making their own “Cliche Family”. What might that look like today? Would it be as easy to make this film today? What are the major cliches seen in most commercials today? For more resources check out our 1950s PowerPoint.